Peramea was declared Cultural Heritage of National Interest in 1985 thanks to its historical patrimony. The urban structures of Peramea match the features of the so called enclosed village, a kind of settlement, compact and closed around itself, where the walls of the houses work as a protective external wall. The medieval central part of Peramea has two main streets, running parallel, one of which still retains totally the façade of the porches, a testimony of its artisan past; even the names of houses still tell us about this organisation in guilds. The origin of Peramea is directly linked to its castle, standing on the north-western part of the village on top of hill, already appearing in medieval documents with the name “Petra Media” in 901 possibly referring to the large rock where the building stood. On the opposite direction and toward midday, there is a small hill outside the enclosure with a second fortification, Torre de Colomers. Its existence is associated to the boundary castle and was used for watching and vanguard. At one end of the village of Peramea there is Era d’Ortega (threshing floor), site of the cultural association called Lo Vent de Port. It functions as an information centre for cultural diffusion, organising activities such as guided visits around the village of Peramea, exhibitions, popular talks, excursions, workshops…etc. L’Era d’Ortega is the perfect example of a unit of production originated around the family structure in a subsistence economy up until the middle of the last century. 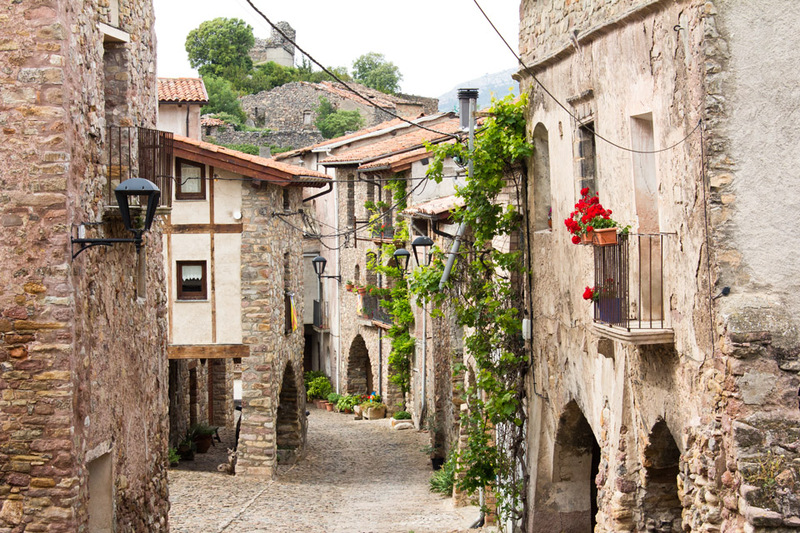 Lo Vent de Port organises guided visits around Peramea to show and interpret the main features of an enclosed village. The visits also includes the entrance to some of the private spaces -found inside the houses of the village, such as a bread baking oven, a oil press, a cellar and a smith, apart from the church, the prison and the threshing floor of Ortega-, which will help us understand better the everyday life in the recent past. This places and the activities carried out there where the sustaining network for the economical and social structure in our territory. 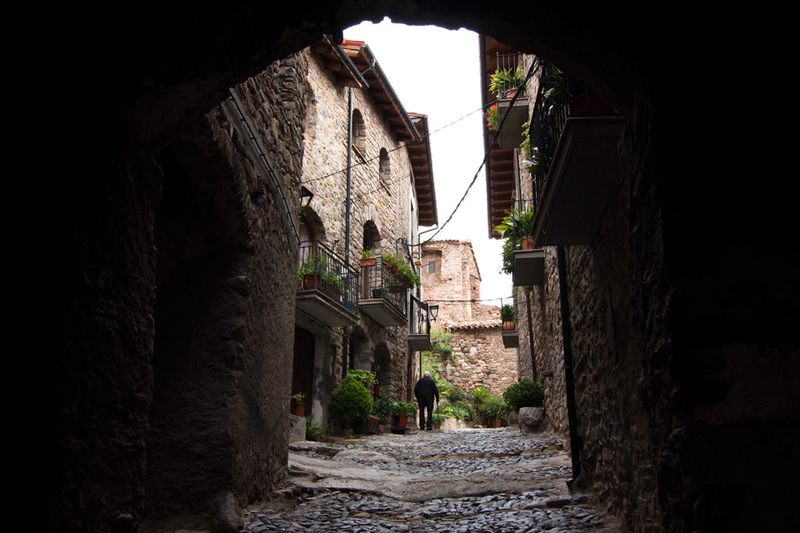 Below the rock of the castle one finds the church of Sant Cristòfol, with the remains of the Martissant Saints. Every 28 December, on All Fools Day, these relics are taken out for their worship. Tradition tells the count of Pallars brought them form the Holy Land after surviving a crusade. Worth mentioning also are the polychrome (multicolour) carved sculptures in wood representing Mare de Déu del Remei from the 13th century, and a Gothic baptismal basin and several carvings from the Baroque period. Further along, we will find a crossroad, where the Dolmen de la Mosquera is indicated, a megalithic monument with funerary purposes from the Bronze Age. This one, together with others around the whole of the are in Pla de Corts and the artefacts found in archaeological excavations tell us about an ancestral time when this was a privileged spot for humans due to its geographical and climate conditions, favouring agriculture. Out from de Peramea towards Bretui and following the signalled itinerary, we will find the path to the Fountain of Sant Cristòfol, (the drinking trough on the right is a sarcophagus from the 13-15th centuries where the old Romanesque church of Sant Cristòfol stood, also seen in the perfectly cut and polished stones making the wall of the fountain).